The origin of Scott Gundersen’s wine cork portraits can be traced back to his travels through the Democratic Republic of Congo in 2007. He loved how so many of Congolese people wasted nothing– every item, whether an old water bottle, broken shoelace or the bark from the Banana tree, was creatively repurposed. Compelled by the resourcefulness and ingenuity of the people he met in each village and market, Gundersen returned home dedicated to infuse his own art with these same concepts. 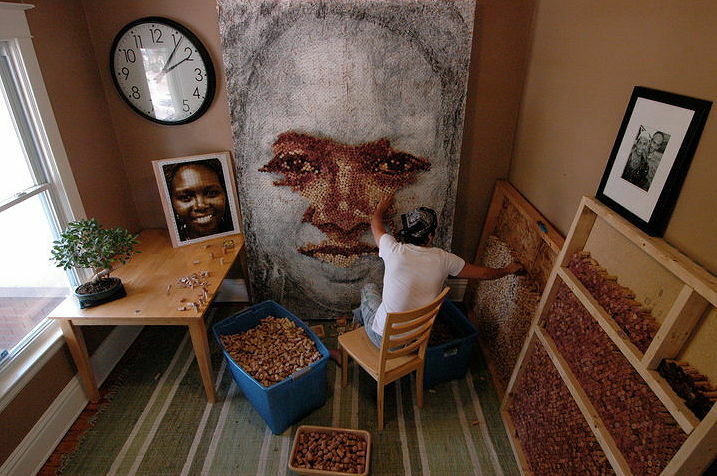 Drawing on this idea of recycling, along with his love for mosaics and his penchant for drinking red wine, Gundersen collected corks for two years before making his first recycled wine cork portrait in 2009. 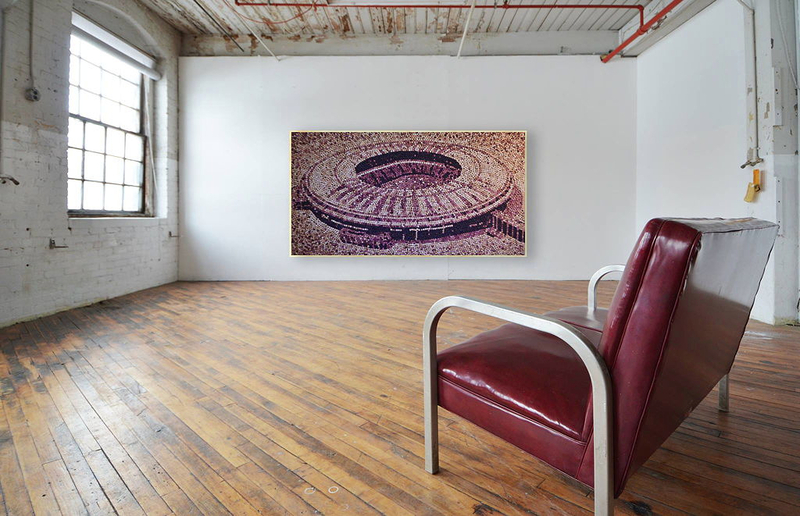 In the years since, Gundersen has used over 200,000 corks in mosaics created for private collectors and corporate clients on four continents. Be green – recylcle your wine corks! The idea to create artworks with cork is kind of unusual. Tell us about the story you got into cork and artwork. Nine years ago, in the summer of 2007 my wife and I were traveling through Africa visiting some friends, we would go through villages and markets and see how local artisans would repurpose everyday materials that we would throw away, like plastic bottles or paper magazines. I would see how they would turn things we would call garbage into art. After returning home I was cleaning after a dinner party, as I picked up the wine corks from the night I noticed the beauty of the corks, how each one had a different color and a different stain. I thought if could gather together enough of them I could use them to create a portrait. That set off two years of walking the streets of my town, asking bars and restaurants to save their wine corks for me. 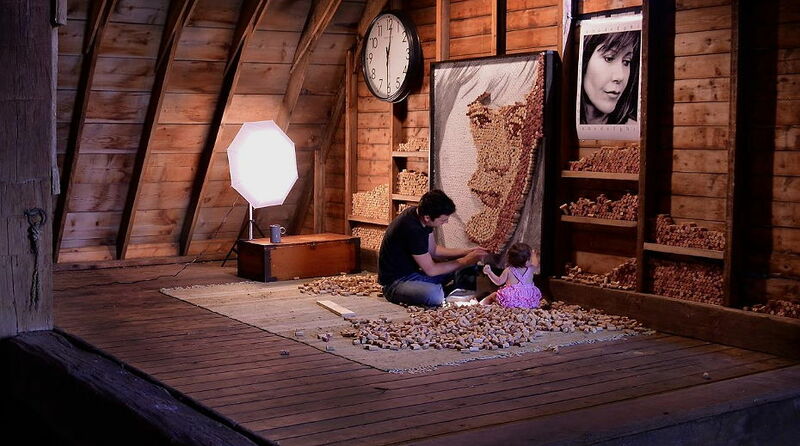 In 2009 I finally had enough corks to create my first portrait, an image of my wife, Jeanne. It should be nearly impossible to drink so many bottles and use the cork for your work. Where do you get the corks from? All these years later I still get many corks from friends and family, but often I will need 20,000 or 50,000 or 70,000 corks for a project and thus I have found different cork recyclers in the United States where I can purchase the used corks for my murals. What has been so far your largest work and how many corks did you use? My largest mural was a 10 foot tall and 25 foot long mural I created for the American television show Cougar Town. 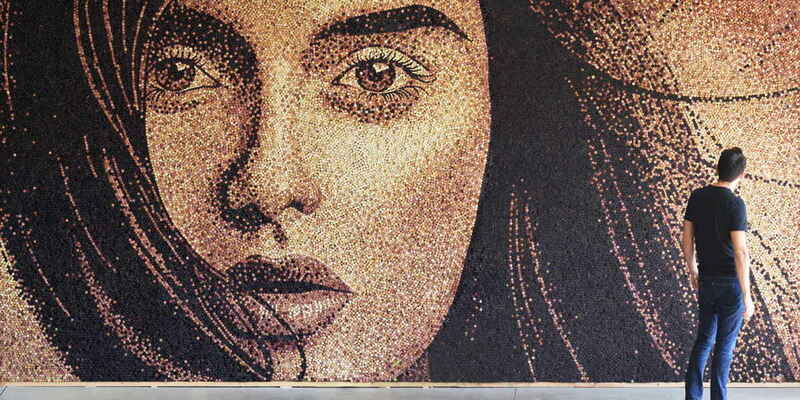 That mural used more than 60,000 corks. Mainly your artwork is about portraits. How is the creation process and which persons you prefer to make „immortal“. The first two murals I created were of people I cared about. First my wife and second my friend Grace who lives in Rwanda and was someone I first met on that 2007 trip to Africa from where this idea began. The last 25 or so projects have all been commissioned. 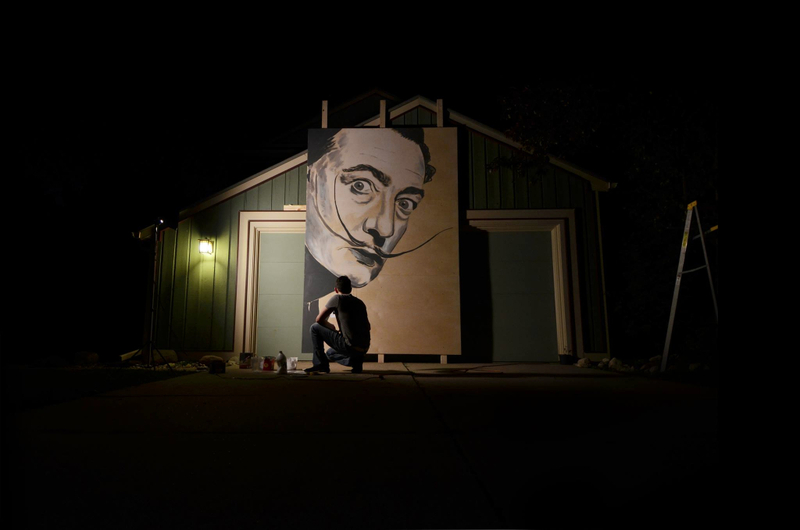 So someone will contact me through my website www.scottjamesgundersen.com and commission me to create a mural of someone they care about, a family member a friend, etc. Actually your work is a beautiful example for upcycling. Would you encourage artists to start with this kind of art and which character traits an artist should own to be patient enough to finish? As an artist and a high school teacher I am always experimenting with different materials and different ideas. The cork mosaics that I make today were just one of those ideas, an idea that has been surprisingly successful. I would just tell people to try their ideas out, see what happens, if one idea doesn’t pan out, try another idea. But most importantly, do things that bring you joy and challenge you and if you do those things well, often other people will notice. Last but not least: What is your favorite white and red wine? I do love wine but it would be far to difficult to choose a favorite. Because I create cork murals I only buy wines that use real natural cork and not synthetic or plastic or screw top closures. Not only are the corks necessary for my work, I also believe there are the best wine closure, they are natural, renewable, sustainable and free of the chemicals that might make up some of the synthetic corks. Wine that uses cork is thus better for the environment and better for me.